Step 1 Chill four soup bowls in the refrigerator. 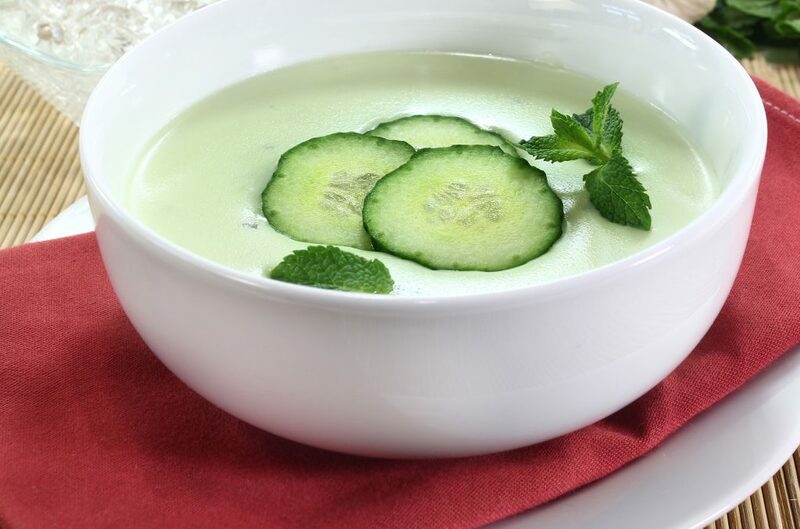 Trim, rinse, and dry the cucumber, then grate it coarsely, with its skin, into a large bowl. Step 2 Rinse and dry the bushy mint. Strip the leaves from the stalks and shred enough to give 4 tablespoons, or bundle the leaves together and cut them diagonally into ﬁne strips with kitchen scissors. Add the mint to the cucumber. Step 3 Stir the yogurt, cream, and vinegar into the bowl. Season well with salt and pepper and stir again. Step 4 Divide the soup among the four chilled soup bowls. Add one or two ice cubes to each one if you like to chill it quickly. Garnish with the small sprigs of mint and serve. This is a great soup to make on a steamy summer's day since it requires no cooking at all. Just mix the ingredients together and the soup is ready to eat.